Having trouble listening to your music while swimming or sweating? 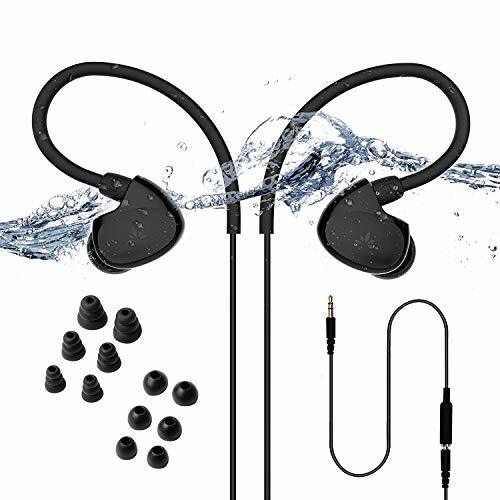 We’re here with a wide selection of some of the finest waterproof headphones that will help you enjoy your music while hitting the gym, exercising, swimming, or generally partaking in any activity that involves water or sweat. There are over twenty models for you to choose from, spread throughout various price point categories. If you already know what you are looking for, we’ve split the article into the following sections and you can jump right to our reviews. If you need some help learning about the types of headphones and how to find the perfect match, check out our buying guide at the bottom. The best ‘overall’ virtually translates to the ‘best of the best’. These headphones are the most versatile, their soundstage is either the most powerful or the most balanced, their waterproof rating is the highest, and so on. What’s important to note about the headphones in this section is that they’re pretty expensive, and they usually cost several times more than average earbuds. So, the criteria when determining the best waterproof headphones ‘overall’ was strict, to say the very least. First of all, such headphones need to sound not just great, but over-the-top great. If you’re paying this much money, you should be able to enjoy in your music on an audiophile level. Balanced soudnstages with a strong bass response help a lot. Boutique level earphones simply need to be tough as nails. Durability is one of the most vital aspects of good earphones, especially since most feature the in-ear design, so you could possibly imagine what would happen if they were to break inside your ear. Thirdly, connectivity is also quite important. Various versions of Bluetooth are available, but the latest one is 5.0. Alternatively, you could settle for 4.0 as it’s pretty similar in terms of performance and value. One of the slightly overlooked aspects of wireless earbuds is the battery lifespan. Most ‘good’ earbud models can hold up to some eight hours per charge, which is considered as a standard, but that only means that boutique level earbuds need to top that. For example, Mpow’s D4 does have only eight hours of battery life, but it makes up for it with the quick charge feature. Wireless, waterproof, and perfect for the pool, the gym, or a run in the rain. The first waterproof headphones we’re reviewing are not just among the best headphones overall – they’re also among the finest headphones ever built, regardless of the label we put in front of them. Their waterproof rating is IPX-7, which basically means that they’re capable of withstanding some serious jets of water, being only a single level away from the best rating (the IPX-8). Suitable for various purposes, the D4 will provide you with means to enjoy in your music, regardless of whether you intend to go swimming or simply want to hit the gym. With up to 8 hours of total battery lifespan, these headphones are quite amazing. That means that they’re also viable for commuting, travelling, and practically whichever scenario you can think of. Though small, the tuned driver, as well as the CSR chip deliver a crisp soundstage, promising a lot in terms of sonic performance. The superbly deep bass can and will be felt, even if you’re submerged underwater, and the same can be said for both trebles and highs. What’s more, they’re remarkably comfortable to wear. The eartips are ergonomic and come in a set of three, so you can choose the size that fits you best. Last, but not least, Mpow’s D4 is also highly user-friendly – there are inline controls onboard which allow you to adjust the volume and receive/make calls. There are just a couple of things we didn’t like as much, though. The first thing you’ll notice straight away is that these headphones cost quite a lot. Namely, they belong to the upper bracket of the ‘boutique’ price point category and are considered as some of the most expensive headphones available on the market. Secondly, the Bluetooth technology integrated in these earphones is a bit outdated – the version four-oh-one can’t even come close to the V5 in terms of stability and reliability, but it’s still fairly great overall. All things considered, Mpow’s D4 are amazing all-purpose headphones that are more than worth the buck. Marketed for the swimming niche, Swimbuds are great if a corded option will work for you. 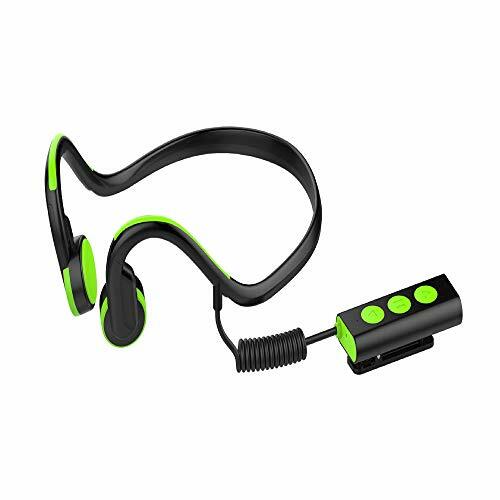 Just after Mpow’s D4 we have Swimbuds underwater headphones bundle. This is actually a wonderfully handy pack that features, aside from the headphones, an extension cord, a USB charger, three water-tight earbuds in different sizes, an iFloatie water-protection system, and a convenient swimming workout made by an Olympic medallist Rebecca Soni. Now, first of all, these headphones have a superb total battery lifetime – it’s nearly twice as good as D4 with 15 full hours of playtime. What’s also great about it is that it’s user super-friendly with convenient onboard controls. The construction of these earbuds is simply amazing, as they boast two level memory-wire build, so they’re not just waterproof, but also highly durable in their own right. To top it all, they’re remarkably comfortable to wear – the buds are made of exceptionally plushy materials which aren’t intrusive at all. The only thing about Swimbuds that we didn’t like so much is the fact that they have a rather low ‘top volume’ level. Certain songs might appear as quiet, especially underwater. Anyhow, they pack quite a value for the buck due to the other benefits they bring onboard. Not a great option for swimming due to the lower IPX rating, but perfect for rain and sweat. Next up is LQHLP’s waterproof headset. These wireless headphones feature an IPX6 waterproof rating, which means that they’ll endure the rain, sweat, and minimal submersing, although they might not be so good for swimming. What’s so great about them is the fact that they come outfitted with a remarkably powerful Lithium-polymer battery. It can last up to full 20 hours and charges up in mere hour and a half. On top of that, these headphones are a pure pleasure to wear, as they sport an ergonomic, flexible design with silicone tips and memory foam plugs. Suffice to say, waterproof earbuds and headphones are usually intended for specific purposes, but this particular model is more versatile. Since the bat is so strong and the buds comfortable, you can easily take them on any of your travels or commuting instances. In terms of aesthetics, the LQHLP wireless headphones look very modern. They’re available in four colour variations, including Dream Purple, Gun Color, Local Gold, and Sky Blue. Another great thing about them is the latest version of Bluetooth – the version 5.0. It provides a more stable, reliable connection and has an enhanced range when compared to all variations of the version 4. Lastly, these headphones are made of exceptionally robust nano coated materials that ensure premium water resistance and longevity of the build. A less expensive model, but great if you don't have a lot of room in your budget. The last waterproof headphones in our ‘best overall’ section come from ABCShop. Generally speaking, most people would assume that earphones as cheap as these can’t be some of the finest the market has to offer, but exceptions are possible, and we’re here to show you why ABCShop’s earbuds are one. Firstly, these headphones pack a massive soundstage that delivers HD audio in stereo format. The driver unit is, perhaps, somewhat weaker than Mpow’s, but it’s still pretty formidable all things considered. Secondly, ABCShop’s earbuds pack the latest Bluetooth technology, offering you seamless and lossless rendering and superior connectivity. What’s more, there’s also the fast-pairing feature which pairs the buds immediately upon pulling them out of the charging box. Speaking of which, you’ll get one as a complementary feature. These headphones feel very comfortable to wear, but the single bad thing about them is that the same can’t be said about the fit – there are no hooks or loops that will ensure that the buds remain completely secured in your ears. Now, ABCShop’s headphones have the IPX7 waterproof rating, which means that they will resist water even when submerged. Inline controls call be used in virtually any setting as well, which is just another big plus. Last, but not least –they’re several times cheaper than any model in this section. This section of our review is diametrically opposite of the previous (the best overall), so it would be wise to lower our expectations in turn. Simply put, ‘cheap’ headphones are just that – they don’t cost that much because they lack in one (or often several) fields of performance. In order to better understand the criteria we used when evaluating the earbud models, we’ve decided to break down the qualities ‘cheap’ waterproof headphones need to have and put them in an orderly fashion. There are cheap headphones that are outfitted with good drivers, those with reinforced durability, wireless models, and what not, but we’re reviewing waterproof and water resistant headphones today. Basically, the water resistance technology comprises a big portion of earbud’s price, whether it’s the sheer build (water resistant cables and buds) or an extra layer atop the construction. The minimal acceptable water resistance rating of earphones is IPX5 – that means, in plain words ‘not waterproof, but partially water resistant’. There are models, of course, with higher water resistance ratings in this department, so don’t be surprised to find earphones with IPX6 or even higher. While premium earphones have exceptionally high battery charge going up to 15 hours and above, cheap headphones are usually good enough to meet the standard 8. Usually, fast charging features aren’t introduced, but exceptions are possible. Driver units on cheap headphones are fairly smaller almost by default, and most models in this price point category are usually quiet in comparison to more expensive models. As for the soundstage, certain models have a solid bass response, but they usually lack in highs. Eartips are fairly easy to manufacture, so even the least expensive headphones are usually quite comfortable to wear. What’s the most common flaw of these earbuds is that they’re often designed poorly, so using them for extended periods of time usually results in ear fatigue and slight discomfort. A great pair of waterproof headphones for swimming that also happen to have a budget price tag. If you’re looking for budget headphones that won’t break down as soon as you spill something on them, H20 Audio’s buds might be a perfect choice for you. In a nutshell, these are stylish, comfortable earbuds that have the highest IPX rating (IPX8), the fact that they’re cheap is just a bonus. Since we’ll talk about the IPX ratings later on, everything you need to know about the IPX8 is that only headphones that are capable of resisting water 100% are rated as such. The next good thing about H20 Audio’s headphones is that they have a fairly balanced soundstage with decently deep bass. Of course, these are only budget earbuds, so you’ll find treble as lacking, and the highs leave enough room for improvement as well. These headphones feature an ergonomic design, so you can rest assured that both the comfort and fit they provide are phenomenal for the money. The only potentially bad thing about them is that they’re very small, so people with larger ears might find them as completely unusable. All things considered, these headphones are definitely among the best cheap waterproof headphones on the market, and we highly encourage you to at least consider them. Ear hook keeps them in place during physical activity and various size attachments to make sure they fit perfect in your ears. Here we’re looking at Avantree’s TR509 waterproof earbuds. Essentially, these headphones are stylish, very comfortable to wear, and they rock a decently balanced soundstage. They got exceptionally comfortable earhooks that provide a secure, lock-on fit which ensure that they’ll stay in your ears regardless of what you’re doing. They’re equally good for beach sports, exercise, and gym, but since they’re wired (and you don’t need to rely on any kind of batteries), they’re also good for travel and casual listening. The manufacturer clearly states that they used a short cord for these earbuds so that swimmers could enjoy them the most. What’s more, the buds were purposefully made to ‘shrug off’ water, which means that they dry rather quickly, allowing for easy and safe storage. One of the best things about these headphones is that you’ll get two sets (two types) of earbuds in three different sizes for free. Though the soundstage leaves plenty of room for improvement, these earbuds pack quite a punch for the buck all things considered. The cheaper model of our #1 pick, the Flame is slightly less durable with a great price. Basically, Mpow’s not that much of an underdog brand as far as wireless earbuds are concerned, mainly because they use a similar set of technologies in both their expensive and inexpensive models. We’ve seen one of Mpow’s models in our ‘best overall’ section, so we’ve decided to add a more affordable option from their stock in our review. First off, the thing that probably interests you the most is the waterproof rating of these earbuds – it’s IPX7, which means that they’re equally good as D4 in this respect. 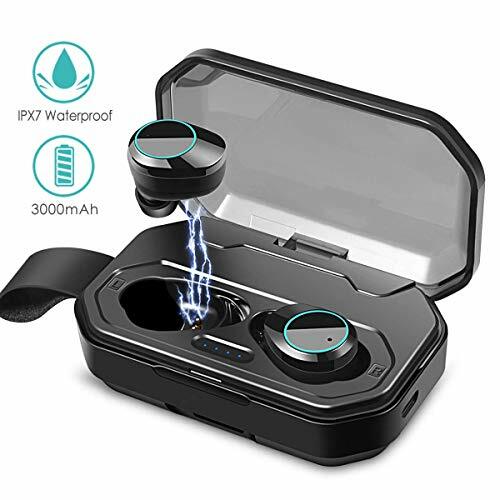 What’s more, both of these earbud models were made of special nano coated materials that work like a charm at protecting them against sweat and water. Overall, it would be fair to say that the soundstage is balanced, although it’s a bit heavier on the mids and bass. 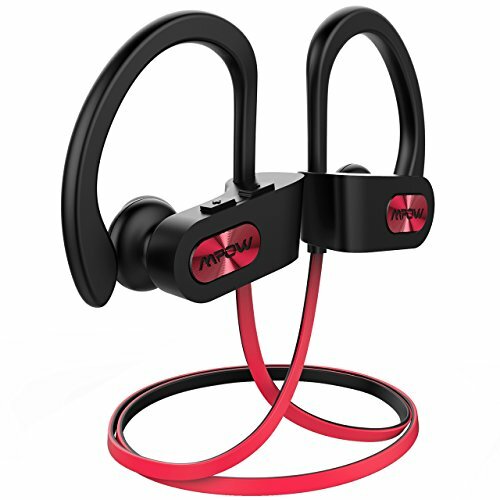 In terms of connectivity, Mpow’s Flame headphones feature Bluetooth version 4.1 – it’s far from being great, but these earbuds are cheap after all, so this should not be such a big deal. The convenient ear hooks provide a very comfortable, snug fit, and to top it all, you’ll get several sets of replaceable ear tips so you can easily find which type fits you the best. They also have a 9 hour battery lifespan and recharge in about an hour and half. However, even the brand notes that overusing the fast-charging feature might eventually harm the battery, so it’s advised not to use it too often. Variety of colors to match your style and a inexpensive price tag great for anyone active. The last earbud headphone model in the ‘cheap’ category is Letscom’s Bluetooth headphone earbud set. Basically, these headphones have the greatest value you’ll find for this price, as they are stylish, have a superb waterproof rating, long playtime, inline controls, and boast a high comfort rating. Of course, they can’t really compare to more expensive models, but they offer everything you need out of a waterproof headphone set. Sound wise, they feature a moderately balanced soundstage. Though sonically they’re not too special, they don’t lack in this department either. They’re outfitted with a CSR chip which provides a strong bass and clear highs, though the mids are all but exemplary. In terms of aesthetics, they’re rather plain and straightforward. The band strap and the plugs are coloured, and you can switch between black, red, gray, blue, green, and pick colour variations. Among the biggest advantages these earbuds offer we can name the IPX7 waterproof rating, which is fairly rare in this price point category, convenient inline controls, and lightweight ergonomic design. We’ve mainly talked about waterproof earbuds up to this point, but now we’re going to cover something a little bit different. Namely, the basic difference between water-proof and water-resistant headphones is that the former are capable of ‘surviving’ higher quantities of water (even submersion) while most people refer to the latter as ‘sweatproof’. In essence, water resistant headphones’s biggest selling point usually isn’t the water-proof quality – they’re either workout buds that have a decent ambient noise reduction, or casual listening earbuds with a great soundstage. Since generalization is relatively impossible due to the versatility of these earbuds, we’ll lay out some of the most vital elements we’ve used as criteria for evaluation. Simply put, IPX4 and lower can’t withstand water while IPX 7 and higher are considered as completely waterproof. That means that most earbuds in this segment of the review are rated either IPX5 or IPX6. Like we’ve mentioned a while ago, water-resistant headphones don’t pride on the water proof quality, rather their forte is often in some other aspect of performance (aesthetic, sonic, etc). As examples, we could point out that Plantronics’ BackBeat has a superiorly flexible design and superbly convenient onboard controls, the Sennheiser’s model has state-of-the-art passive noise cancelation, and Otium’s headphones have a snug-fit pair of earhooks. Though not cheap, water resistant headphones are certainly not as expensive as waterproof earbuds. This is not a rule, and exceptions are possible, but based on the majority of models we’ve sifted through (over two hundred, to say the very least), we’ve deducted that water resistant buds are substantially cheaper than waterproof ones. 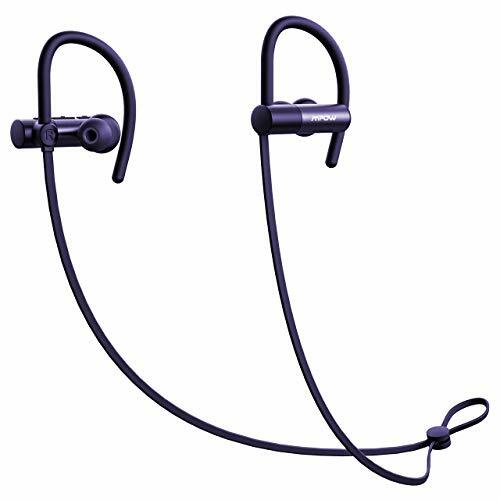 Stylish ear hook and back-of-head design that is inconspicuous and won't get in the way of your active lifestyle. Let’s open this section up with Plantronics BackBeat wireless headphones. They look very urban and feature an ergonomic design which was purposefully introduced so as to provide as much comfort as possible, but what’s so great about them is the fact that there’s a neat little button on the left bud that allows you to pause or resume your tracks (no inline controls, however). There’s another convenience feature onboard – the safety oriented eartip. It was specifically designed to allow the wearer to hear pretty much everything in near vicinity during outdoor activities. As for the looks, these headphones are truly a sight to behold. With bright fluorescent colour matched with elegant black, they look absolutely stunning. They’re also available in red if you don’t like the shine of fluorescent green. Lastly, these headphones feature eight hours of total playtime. Though there are models that are greatly superior in this aspect, eight hours should be enough for whatever exercise or travel you’ve had in mind while using them. There’s just one thing about these earbuds that does not appeal as much. Namely, the left bud puts up a lower audio output. Apart from that, these headphones rock quite a value for the money. Sennheiser makes earbuds? Yep! and the 684is come with the quality and performance you should expect from their timeless brand. Next up is Sennheiser’s PMX 684i earbuds. In essence, Sennheiser rarely puts out ‘activity’ headphones for running, swimming, gym, or exercise – they mainly specialize in manufacturing headphones for studios and audiophiles that rely on superb noise cancelling and exceptional soundstage. The PMX 684i, however, is a great example of how Sennheiser engineers excel in this field as well. First of all, these headphones are incredibly lightweight, and as a matter of fact, there’s a strong chance you won’t even feel them as you start using them. Though they’re not water proof, they’re resistant to sweat and water, being rated IPX6 in this respect. One of the best things about these headphones is actually the thing Sennheiser excels at the most – noise cancelling. It’s passive, but it will negate most of the ambient sounds in your surroundings, which can significantly help during gym exercises. Although they bring many benefits onboard, these headphones are not perfect. They put up quite a lot of ear fatigue after a couple of hours, which means that they’re not exactly great for exceptionally long workout regimes. All things accounted for, Sennheiser’s PMX 684i headphones are more than just valuable for the money. They’re not expensive, the passive noise reduction is great, and their soundstage is pretty formidable, to say the very least. New brand for the space, Otium delivers an effective set of over ear water resistant earbuds for active lifestyles. Let’s wrap up this section of the review with Otium’s Bluetooth headphones. Frankly, Otium is a ‘versatile’ brand, to say the least – they deal with various items, from cigarette lighter splitters, over denim clothes, over adapters for car chargers, to Hi-Fi headphones. Though it’s true that this model won’t give you Hi-Fi audio quality, it’s among the finest earbud models in the price range. First of all, let’s begin by saying that Otium Bluetooth headphones feature the IPX7 waterproof rating – great for exercises, but they’re great for swimming too, since submersion won’t damage them. Secondly, the soundstage of these earphones is decently great. The highs are solid and clear, there’s just about enough bass to be heard underwater (or over exceptionally bass heavy gym music), and there’s even a build in microphone which packs voice notification feature. As far as battery’s lifespan is concerned, Otiums headphones can survive up to some eight hours on a single charge. Though it’s nothing special, it’s definitely just about enough for virtually any training regime, and then some. Inline controls are also present, allowing you to skip, play, or pause your music easily. Suffice to say, the general design of these earphones makes them very user friendly and convenient. Sadly, they feature an outdated version of Bluetooth – the version 4.1. It has inferior range and is subpar in terms of reliability when compared to the current version 5.0. With numerous benefits and but a single flaw, we can easily deduce that Otium’s headphones are more than worth the buck. Versatile, cheap, and solid in terms of performance, they’re great for gym exercise, swimming, beach, and practically every situation you can think of. There’s a thin line that separates this category and the previous one. Of course, you might not need waterproof headphones for gym, so it’s only logical that you’ll opt for water resistant models, but this time around you’ll need to consider slightly different qualities. In virtually every gym there’s loud music blasting through, and even if you’re simply exercising outdoors, the cars, people, wildlife, and various other things hum and buzz, potentially ruining your music feel and experience. Just as there’s a difference between waterproof and resistance, there’s a difference between noise cancellation and reduction. The least you should settle for is the former while the latter is welcomed with open arms if available. Noise isolation means that the sounds from outside are being repelled and blocked almost in entirety. This is great for gyms while for outdoor exercises even ambient noise reduction is acceptable (it doesn’t block outside noise, rather it muffles them). For gyms and outdoor exercises you’ll need protection from sweat rather than water, and IPX5 waterproof rated earbuds provide just that. Alternatively, you could consider IPX6 rated headphones for the scenario when you get caught by rain while exercising outside, but anything beyond that might be a bit of overkill. Any sort of physical activity is best enjoyed in unhindered by external obstacles, such as, for example, earphone wires. The wireless earbud models will provide you with the much needed mobility, but even so called ‘magnetic’ models are good if wired. Let’s face it, your hands will be sweaty after a while, and you don’t want to touch your phone with them unless you really need to, right? Inline controls allow you to easily navigate the track list, pause or play your songs, and some models even have switchable modes. Exercising puts a certain amount of stress on our body, especially at gym. Logically speaking, the sheer battle with this stress of sorts tends to feel a bit uncomfortable. The reason why you need at least your earbuds to be comfortable is more than obvious in that light, and we specifically recommend models with earhooks that ensure a more secure fit. At only 1.3 ounces, the Levin headphones are perfect for lifting, cardio, or crossfit. They will stay in place and keep you in the zone. Levin’s Bluetooth headphones are, as a matter of fact, one of the ‘Amazon’s choices’ in the ‘wireless sport headband’ category, so it’s quite obvious why we’re opening up this section of our review with this particular model. First of all, one of the main reasons why these earbuds are some of the best headphones for exercise and gym is because they’re incredibly light. Namely, they weight only 1,3 ounces, and it’s safe to say that most people will even forget that they’re wearing them simply due to their lightweight construction. Apart from being compact, they’re also very flexible and can automatically shrink. They are wireless, but they come with a slightly outdated Bluetooth version, the 4,2 with a decent range and reliability behind it. Sonically, they perform exceptionally well for the money as they come supplied with the CSR chip. The bass is strong and deep, the mids are slightly weaker, but the soundstage is pretty solid and balanced overall. In terms of battery lifespan, Levin’s Bluetooth headphones can withstand up to full 12 hours of playtime on a single charge. Better yet, they only require 2,5 hours to get the juices back up. What else is convenient about these headphones is that there are several controls on the right bud – you can adjust the volume, pause, play your tracks, or select the mode in the simplest fashion possible. They’re not completely waterproof, but they are able to withstand sweat pretty well – they’re rated IPX6. In terms of comfort, they feel very gentle, do not put up a lot of ear fatigue, and fit pretty well. The only potential problem you might have with them is just that they’re slightly flimsier than they should be. A silver lining here is that they’re very cheap and provide a plethora of benefits at such a low price. 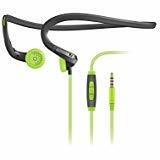 If you prefer an in-ear waterproof headphone, the X5 is our choice for the gym. Next on the menu are Newcos X5 Bluetooth sweatproof earbuds. Newcos might not be as popular as Beats or Sony, for example, but they have a wide catalogue of premium quality earphones, both wired and wireless. The X5 is one of their biggest hitters, offering a convenient design, long battery lifespan, and great audio at a relatively cheap price. First of all, let’s talk about the design of X5. The buds have integrated magnets that prevent them from winding and tangling together. They are exceptionally flexible and very light, so there’s no telling of ear or neck fatigue whatsoever. The waterproof rating of X5 is the lowest in comparison to all other earbuds in our review so far – IXP5. However, that’s more than enough water resistance to get you through gym exercises or rain. It’s quite odd that such a cheap set of headphones comes with the Bluetooth 5.0 – the latest version. It’s got a range of 33 feet (10 meters) and can pair up to two devices simultaneously. High connectivity also means that these earbuds are compatible with the majority of operating systems, including IOS, Windows, and Android. They also have a very capacitive battery which can hold out between six and eight hours per charge, needing only an hour to recharge back to full power. Though they are comfortable to wear, the fit might be an issue for some. The in-ear design is convenient when it comes to exercising at a gym, but there are no earhooks that would ensure it or further enhance it. 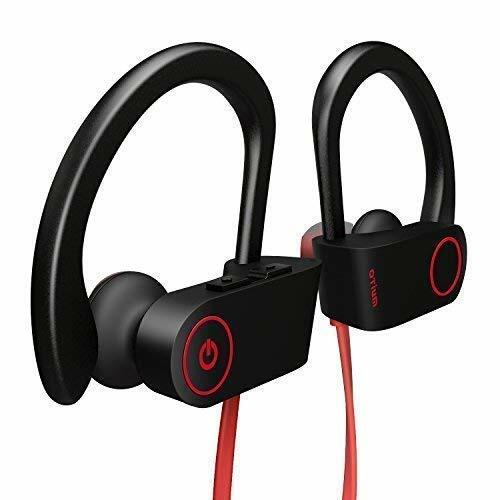 Overall, the reasons why these headphones are so good for gym are because they’re light, the battery is pretty strong, the IPX5 waterproof rating is more than sufficient to protect them from rain, the Bluetooth 5.0 is the latest version, and they’re incredibly light. To top it all, they come at a very cheap price. Nothing too over-the-top with the BHS-530s, but you will get a solid set of in-ear waterproof headphones that are perfect for exercise. We’re looking at Phaiser’s BHS-530. You might’ve heard about this brand before, as some of their earphone models such as Tecton, Strobe, Dash, and Arc have gained quite some renown in the past years. Most people don’t pay too much heed to how their earphones look when they hit the gym, but wouldn’t it be awesome if yours actually looked cool? The BHS-530 are absolutely phenomenal in terms of aesthetics, sporting a very stylish outlook. What’s even better is that they come in six colour variations, including blackout, heliotrope, icegrey, limegreen, oceanblue, and redheat. The Bluetooth version these earbuds feature is 4,1 – nothing too special, but far from being bad per se. Apart from that, the connectivity is quite great – you can connect them to your TV, laptop, tablet, iPhone, and virtually any similar smart device. They compromise for this little ‘flaw’ with excellent battery that can hold up to 11 hours straight on a single charge. The recharge time takes less than two hours. Now, as for the prime reason why these earphones are so good for exercise and gym – they’re very flexible and robust. Namely, the memory wire they sport is incredibly flexible, which means that you won’t need to fret about them snapping or breaking, no matter how stretched they get (excessive use of force, however, will damage or ruin them). The BHS 530 earphones are completely sweatproof, so gyms and exercising shouldn’t put up any problems, but you should refrain from submersing them or getting them too wet, as their waterproof rating is IPX-6 at best. Sonically, they’re absolutely phenomenal. These headphones provide an incredibly deep bass, and the overall volume is pretty high as well. The only deficit here can be seen in the highs, as they are not even remotely pronounced or as bright as they should be. Considering how cheap they are, these earbuds are actually quite valuable for the money. They’re very loud, sufficiently water resistant, and they’re more than comfortable to wear for longer periods of time. If budget is your main concern, the RedX1 will deliver sweatproof durability and a fraction of the cost of some of our other top picks. Let’s wrap this section of the review up with RedX1’s exercise sweatproof headphones. They offer superior sound quality, they’re rated IPX-6, and have a huge battery lifespan, not to mention that they don’t cost much. They come outfitted with some pretty amazing features, such as the CVC noise reduction technology. Nothing’s worse than being stuck in a gym where there’s overly loud music you can stand and you can’t do anything about it, or at least that would be the case weren’t it for this particular feature. The driver units on these earbuds are fairly big and strong, delivering great bass and boasting impeccable sound clarity. As for the connectivity, it’s pretty great since you can connect to up to two devices simultaneously. The IPX6 water resistance rating means that they might not be ideal for swimming, but they’re completely invulnerable to sweat and rain. Now, as for the reason why these headphones are so awesome – their battery lasts up to 11 hours per charge, and what’s even better is that it takes only 45 minutes to get back online. Furthermore, there’s a built in microphone that allows you to take hands free calls. RedX1’s wireless headphones are also decently comfortable to wear and pack a set of earhooks that ensure a tight, secure fit. What we thought could be improved actually are the inline controls. Basically, these headphones are not the easiest to use, especially since the manual doesn’t explain what some of the function do in much detail. 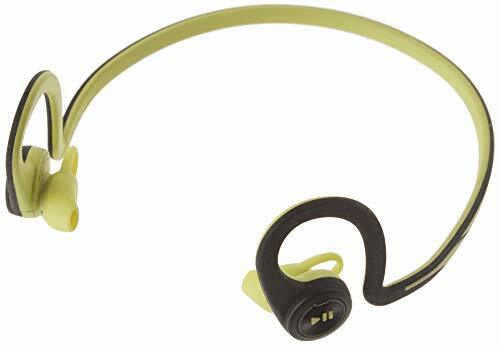 Regardless, these headphones are exceptionally great for gym exercises simply due to the fact that they offer a full package of benefits at the lowest price possible. The price range below $50 is quite broad. In fact, there are more ‘cheap’ headphones than moderately priced and boutique level models when put together. A less well-known brand, Diginex will help budget users buy a set of water-resistant headphones without breaking the bank. Here we’re looking at another ‘Amazon’s Choice waterproof headphones – the Diginex Bluetooth earbud set. They offer strong, firm sound with plenty of clarity and bass, provided by the robust driver unit, but they also excel in several other fields of performance. These earbuds pack a quick charging, long lasting battery that can uphold up to full 9 hours of total playtime (possibly less if the volume is maxed out). With only a single hour of charge, you’ll be able to get it back to full power, though. They’re rated IPX7 and are protected by a special form of nano-coating layer that even further enhances the water resistant qualities it sports. Diginex’ earbuds can even survive accidental submersion for a minute or so. Another great thing about these buds is that they have a very convenient design which provides a remarkably comfortable, secure fit. The buds are magnetic, which means that they can easily be worn around the neck when not in use. They also have a built in microphone onboard, as well as a form of noise cancelling technology with CVC chip that allows you to enjoy your music and take your calls without outside hindrances. Sadly, the cable is not overly durable and without proper care it could snap rather easily. 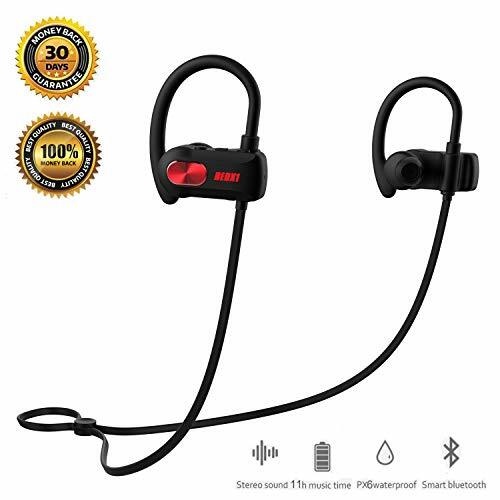 Even though they might not be perfect for jogging or gym, they have a high waterproof rating, a solid soundstage, and the convenient magnetic design, so they’re practically ideal for commuting, in some cases swimming, and similar situations. An even less expensive model from Mpow (our #1 overall pick), The D7 models are great if you want a bit of noise-reduction technology built-in. Here we have another great waterproof earbud model from Mpow, the D7. Among the most notable benefits these headphones provide we can name an incredibly long battery lifespan, superb IPX7 waterproof rating, ergonomic earhook design, and a very comfortable fit. In comparison to other Mpow models, D7 has the longest total playtime of 10 to 12 hours. The ‘Flame’ and S8 could run up to nine hours while D4 and S10 had a modest battery lifespan of eight hours. Although the S10 had superior Hi-Fi audio sonic performance, the D7 boasts HD stereo sound provided by high quality driver units. Another awesome feature of the D7 is the CVC noise reduction technology. Not only does it block outside noise, but it also packs a built in microphone which allows you to take hands free calls rather easily. They’re wireless and have earhooks that provide a tight, secure fit. Furthermore, on the right bud you’ll find onboard volume controls. However, there are a couple of things that we didn’t like so much. First of all, the microphone audio quality is nowhere near good, as the sound can get pretty muffled at times. Secondly, there’s a potentially irritating blue-light indicator on the right bud. All things considered, these phones bear a huge value for the price, even despite the small imperfections that come along the way. 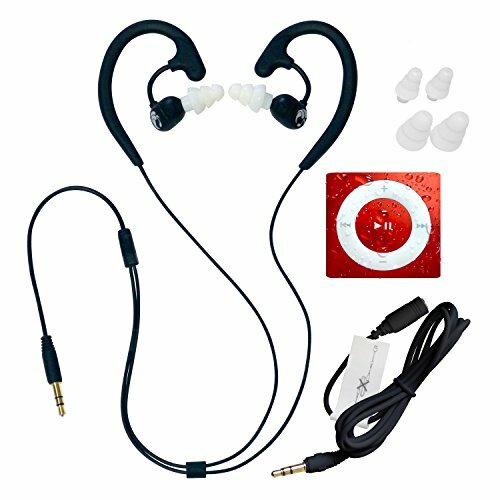 Budget water resistant headphones from a well-known brand. Cowin is a relatively famous headphone brand. You might’ve heard about their E7 Pro or E8 studio headphones, as they were pretty hot in the past few years. Now, they’ve built something entirely different with HE1 – these are actually remarkably cheap headphones that offer a basic set of sonic and convenient benefits. The first thing you’ll notice about them is that they put up such an amazing soundstage. They sound as if they were at least two price point categories up due to the full bodied, robust sound delivered by high performance driver units. Though there’s no telling of noise cancellation, it’s great that HE1 has even some ambient noise reduction. They’re moderately comfortable to wear, and the fit is pretty mediocre– they do put up some ear fatigue after a couple of hours. Lastly, Cowin HE1 earbuds are rated IPX5. All things considered, these are actually major benefits considering that they cost as much as they do. Stylish, great fit around the head, and water resistant great for running or the gym. Beautiful, innovative, and exceptionally valuable would be the words that best describe how most people feel about BoneIn’s BN-702 headphones. They pack a huge array of versatile features and aim to deliver the best sonic performance possible, and that’s putting it mildly. First of all, let’s talk about BN 702’s design. The special form of ear hooks these earphones pack provide a secure fit while enhancing the overall comfortability. They’re also very portable and foldable, but what else is good about them is the fact that they’re wireless, so you can wave tangy cables goodbye. 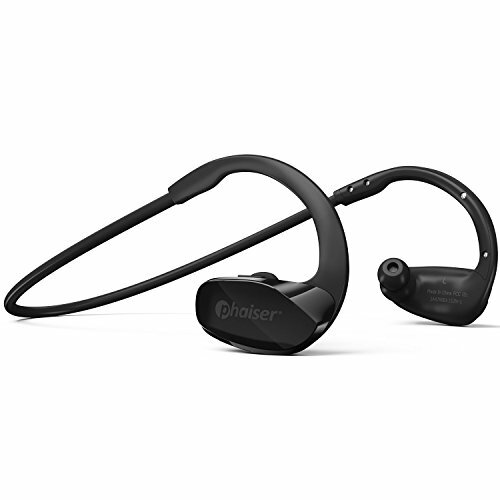 They have a IPX6 water resistant rating and pack nano-coated materials which seal off the circuit, easily preventing sweat and water from affecting the quality of sound. Although there are no inline controls, there’s a convenient play/pause button on the left bud. A total of 11 hours of playtime are at your disposal, though there are no quick charge features whatsoever. Overall, BoneIn’s BN 702 stand for one of the finest waterproof headphones under 100 dollars, and possibly a bit beyond that even. JBL's first entry in our list in the mid-range category. The Endurance waterproof earphones has a unique built-in storage for music. The last earbuds in our review come from JBL – a world-class titan in the headphone and speaker industry. The ‘Endurance Dive’ earphones are possibly the best waterproof headphones that were ever created – massive internal memory, superb waterproof rating, latest Bluetooth technology, and a massive soundstage are just some of the benefits they bring to the table. First of all, these earphones have an onboard memory slot – a whole gigabyte is at your disposal to store your tracks and listen to them directly from the headphones (you don’t need a smartphone once you upload them). Secondly, the ear hooks provide a secure fit without reducing the overall comfortability. They’re considered as ‘smart’ as they automatically turn on when you put them on and shut down when you take them off. 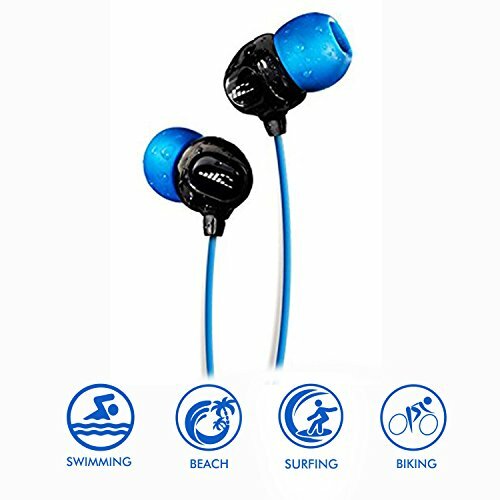 With the excellent waterproof rating of IPX7, these headphones are great for swimmers, especially due to the fact that the onboard storage completely takes off the need to have an actual smart device handy. In terms of battery lifespan, they’re pretty decent. They can last for up to eight hours and need eighty minutes to charge back to full power (ten minutes give an hour of playtime). The Bluetooth technology used here is great, but it has its own limitations. Namely, it won’t work under water, so you’ll need to rely on the internal memory and the songs you’ve put there. In any case, JBL’s Endurance Dive offers a plethora of unique benefits, so it goes without saying that they’re more than worth the money. Even though every separate section so far had a little buying guide on their own, there are certain questions that we didn’t answer yet. It might be wise to figure out the IPX ratings, the difference between water resistant and water proof, and how to make headphones waterproof and check back to the reviews with the newly acquired knowledge, so let’s get straight to it. Though it’s a bit confusing, the IPX ratings are used for both water-resistance and dust-resistance standards without any particular indexes apart from the numbers that simply state how ‘efficient’ the labelled items are at surviving one or another. Since we’re talking about water resistance, let’s forgo the dust resistance for the time being. IPX0 – The first level of water resistance actually offers no protection at all. IPX1 – The lowest water resistance rating offers minimal protection from dripping water which is equivalent to a single millimetre of rain/minute. IPX2 – The second level offers some protection against dripping water if the item in question is angled by 15-degree of its original position. The water surface higher than 3 millimetres of rain/minute could damage the item. IPX3 – The third level provides protection from spraying water. IPX5 – The lowest actual water-resistance level that provides protection against jets of water. IPX6 – items with IPX6 rating are completely impervious to rain and sweat, although immersion will still damage or ruin them. This is a relatively simple question that deserves a simple answer. Plainly put, water resistant items are all that have water-resistant ratings up to IPX6, which means that they won’t break down in case of dripping water, spraying water, splashes of water, or water jets. Waterproof items, on the other hand, can withstand being dripped into water up to a meter and several minutes. How to make headphones waterproof? Sadly, you can’t tinker around with headphones and make them waterproof. The only way is for a manufacturer to utilize special coats and materials, so unless you have such technologies and means to use them, you’ll have to resort to buying waterproof headphones. We’ve seen a lot of premium quality earphones, earbuds, and headphones, but now it’s time to pass on the final verdict – which headphones are the best of the best? Since we’ve already split the review in several sections, it would only be fitting to have a single model as a representative of each category. So, for the best overall, we recommend Mpow’s D4 waterproof headphones. They’re very expensive, true, but they offer the ultimate experience – versatility, power, battery, waterproof rating, simply everything about them is superior. The best cheap waterproof headphone set is H20 Audio’s headphones. They’re very comfortable, have a decently balanced soundstage, and they also boast the highest IPX rating – IPX8. 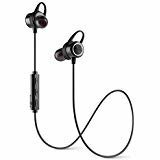 The best water-resistant headphones are Plantronics BackBeat while the best waterproof headphones for exercise and gym are Levin’s headphones. The best under $50 are Mpow’s D7 while the best under $100 are BoneIn’s wireless headphones. Take a look around, browse all you like, and take a pick, there are so many models to choose from, and each brings a different, exquisite set of benefits onboard. We hope you liked our picks, we wish you all the luck in finding the best waterproof headphones!